Founded in 1890, The Lane Construction Corporation is one of America’s leading construction companies, specializing in heavy civil construction services and products in the transportation, infrastructure, and energy industries. Lane has a unique combination of capabilities including public-private partnerships / innovative financing and joint ventures, large, complex design-build and bid-build projects, as well as the ability to produce and install asphalt, aggregates, and concrete. There was no external access to project documents stored in file shares. Each office location was using a different filing system and it was disorienting for staff who were going between offices. Tracking pursuits (prospects) in Excel files was tedious and lacked an overview of pursuits status. No universal location for tracking project schedules, tasks, issues, or team members. 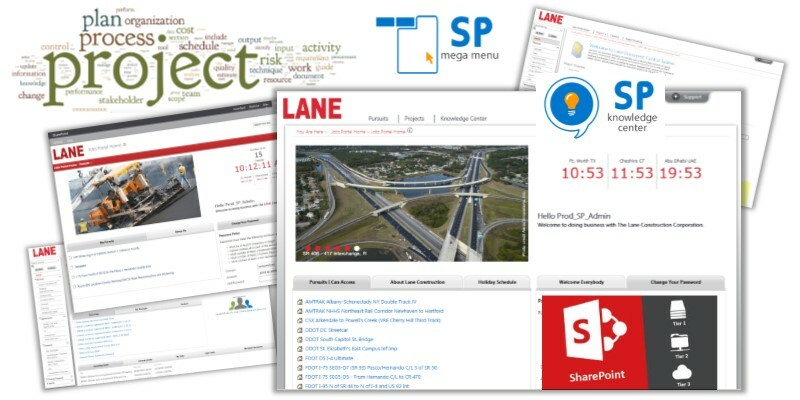 As usual with our projects there was a large amount of infrastructure work to install SharePoint (2013) 1.) for a development farm on-prem, 2.) a cloud-based three-tier production farm, and 3.) transfer an initial on-prem data (proof of concept) to the new cloud. This entailed plenty of SQL optimization and synchronization between farms. We collaboratively designed a standardized project template that includes tasks, scheduling, risks, issues, content management and customized permissions. We also designed a standardized document taxonomy and document file plan numbering system. Install & design of metadata content hub and metadata. Custom PowerShell scripting for sites provisioning, security groups setup, and pre-population of key data. Ability to migrate data from a "pursuit" to a project without having to rekey in project data or re-setup permission groups and custom permissions on libraries. Data aggregation (using 2013 Search) to make dashboards of a project managers projects, tasks, and documents (and more) in one location. Search customization w/refinement panels for easy search filtering. A formally defined IT project management process (and electronic storage framework) that ensures consistency across projects, security of confidential information, and the ability to share and manage documents with external business partners. Contact management solution with a master company list and associated contacts that is used throughout the site. Custom search scopes and custom refiners for finding and tracking agreements. Scripted permissions and default data for better search refinement. If you're going to do a SharePoint migration, you will want to be sure that you're using the best Microsoft SharePoint consulting services so your project will have the results you were expecting without any surprises. Please read more about our zero business outage SharePoint migrations here and contact us today!